Black Gate » Articles » Get Out of the Dungeon with Monsters! Monsters! Get Out of the Dungeon with Monsters! Monsters! Some 35 years ago, I read an article in The Space Gamer on an unusual little game called Monsters! Monsters! I’m not even sure I’d played D&D when I first read about Monsters! Monsters! 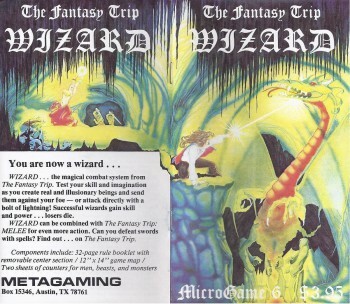 I was introduced to fantasy gaming by Metagaming, and specifically their brilliant mini-games Ogre, Melee, and Wizard, all designed by Steve Jackson. Orge everyone knows about — if you didn’t play the game at the lunch table in high school when it was first released in 1977, then you’re probably aware of last year’s Kickstarter campaign that raised nearly a million dollars for a massive 14-pound Designer’s Edition. I doubt every copy of Ogre in the world in 1977 totalled 14 pounds. I think Ogre may have the unique distinction of being the simplest and most spare SF game ever created, and now it’s also the largest. Anyway, it was Melee and Wizard that first taught me all about role playing. I rolled my first attack dice in a school cafeteria in 1978 (I missed). The rules were simple, the miniatures were made of paper, but the magic was exactly as advertised. I carried those games in my back pocket for years, and my friends and I were die-hard Metagaming fans long before we stepped into our first dungeon. Metagaming’s house organ was the magazine The Space Gamer, where they advertised upcoming releases, chatted about the industry, and generally talked up their games. It was there I first learned of the wider world of role playing, and where I discovered an odd little game called Monsters! Monsters! that they released in 1976. Monsters! Monsters! 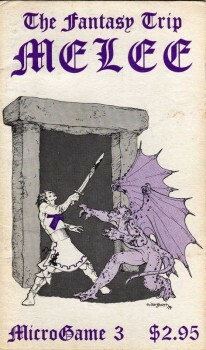 was written as a Tunnels and Trolls variant by creator Ken St Andre. The premise was intriguing: instead of adventurers, the players were monsters who came up out of the dungeon to raid human towns, collect loot, and amass an underground hoard. Like Ogre and Wizard before it, Monsters! Monsters was a very simple game. The rulebook was a slender 40 pages, including an 8-page center section describing the Woodesdge Inn and the surrounding countryside. Now, remember that 1976 was the very dawn of role playing. The whole industry was new and, for Dungeons and Dragons at least, the focus was very much on the dungeon. Players marched into an underground maze, beat up its inhabitants, and left laden with gold and magical treasure. In large part the game was still true to its wargaming roots — it had pages of rules for hand-to-hand combat, pole arms, and damage from torches and 10-foot falls, but God help you if you stepped out of the dungeon to adventure under the light of the sun. You were on your own. The objective for Monsters! 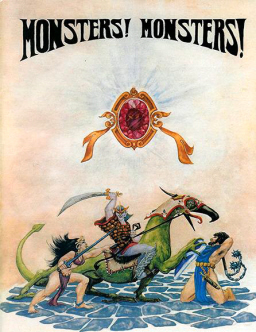 Monsters!, to gather gold to take back into the dungeon, parodied the dungeon-based, loot-and-scoot mentality of D&D, and especially its killing-based experience system. In Monsters! Monsters!, characters received experience points for wanton cruelty, and destruction above and beyond the call of duty. That brief article in The Space Game fascinated me. Monsters! Monsters! sounded vastly more interesting than the simple gladiator combat of Melee and Wizard, even with their rudimentary system of leveling up. For a brief time after reading it, I debated making Monsters! Monsters! our next game, and our first step into the wider world of genuine role playing. That didn’t happen. The next game we tried was Dungeons and Dragons, and the rest is history. The chief reason was simple: I could never find a copy of Monsters! Monsters! In fact, I kept an eye out for decades, but the game proved maddeninly elusive. 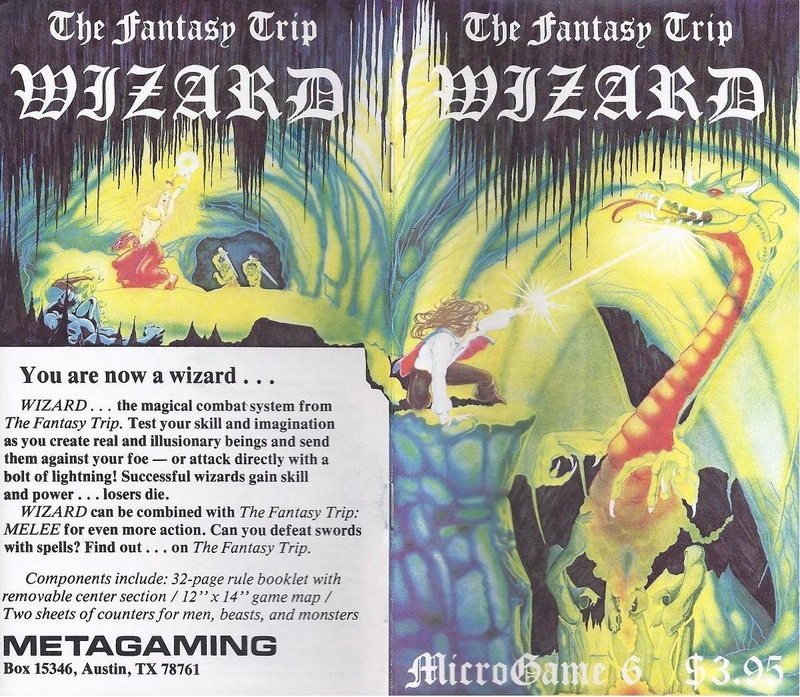 Metagaming, after a glorious period of legendary productivity, went out of business around 1981. Monsters! Monsters! was eventually reprinted by Flying Buffalo, publishers of Tunnels & Trolls, and kept in print (allegedly) for a few years. That didn’t mean it was easy to find, though — believe me. In any event, I finally came across a copy during the Paris Fashion Week of Games — also known as the Games Plus Spring auction. Bidding was spirited, but I was able to bring home a copy for under $20. I’m well pleased with my purchase of the original Metagaming version. The game is well written, with plenty of delightful Liz Danforth art, and my games library is no longer missing an important piece of gaming history. I’m playing D&D with my kids these days, and who knows — perhaps we’ll set aside our AD&D rulebooks one weekend, and pick up Monsters! Monsters! instead. Monsters! Monsters! was published by Metagaming in 1976; it is currently in print from Fying Buffalo. Both editions are 40 pages in softcover, with color covers and b&w interiors. My copy has a cover price of $5.95; the new edition is $14.95. PDF copies are available from Steve Jackson games for $7.50; they also offer a 4-page preview here. I followed the Tunnels and Trolls crowd for a couple years but i’ve all but stopped now. I’ve thought about picking this up. If you ever try it you’ll have to make a post. I liked how easy T&T was to pick up and play. 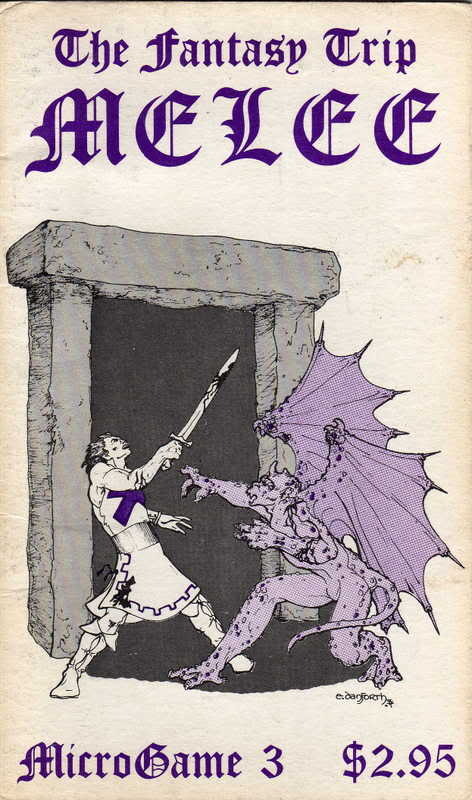 I think if TSR hadn’t produced their own Basic D&D boxed set, it might have been the entry-level RPG of choice for many. And trust me — if we do try the game, I’ll be sure to report back here!